Thank you so much for coming to my signing! It was great to meet you. I’m sorry you didn’t get my responses to these questions earlier — I remember answering some them, but maybe I forgot to send the email or it got lost in cyberspace. But here are my answers. I hope they are helpful. And please say hello to your book club for me. Why did you write the book? What was your insight in writing it? I was working at Fireside Books when I came across the little children’s book illustrated by Barbara Lavalle that told of the snow child, and it just lit my imagination on fire. I had been working on a different novel for nearly five years, and I abandoned it to write The Snow Child. It felt like the story line I had always been looking for — a fairy tale set that could be set in my Alaska backyard. I had always wanted to write a novel that walked that fine line between gritty reality and the fantastical, but I also always knew that Alaska would be the backdrop for my fiction. Much of the day-to-day descriptions of life in Alaska are informed by my own lifestyle growing up in Alaska, raising a garden, hunting, fishing, trapping, living through long and dark winters. But the specific situations of the characters required me to empathize with them to try to understand — what would it be like to never have children when you so wanted them? What would it be like to be new to Alaska and wondering if it was a home for you? You’ve written Mabel’s story and Jack’s story, have you ever thought about writing Faina’s story? It’s funny you ask — I have page and pages I wrote from Faina’s perspective. But I realized that it took away so much of her mystery and magic, so I cut those pages. And now I’m not even sure they are true to the story anymore. Like Jack and Mable and Garrett, I’m not sure how much I know about Faina. What was your purpose in not giving us closure on Faina’s humanity? Is this because you are planning a sequel? No, there won’t be a sequel. I wanted the story to end with different possibilities existing at one time. 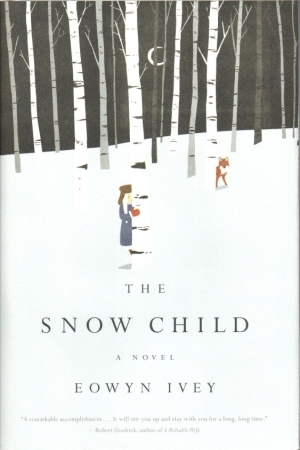 I like books that leave me wondering and thinking some at the end, and I hope The Snow Child does that for readers. Was your non-use of quotes in the dialogue with Faina to indicate she was imaginary? I’m glad you noticed the lack of quotes. Not all readers do. When I first began writing Faina’s dialogue, I felt as if I had tied her too firmly to the ground somehow. So then I experimented with stripping away all quote marks, and that didn’t feel right either. That’s when I struck on the idea of just not using them when Faina is part of the conversation. I hoped it would make her seem more ethereal, more extraordinary, and not quite part of the everyday world. Do you believe in the afterlife? Some of us believe that Faina was an angel on earth. Did Mabel actually succeed in committing suicide? Is the rest of the story what happens after her death? No. Definitely not. I have had a few readers come to this conclusion, and while I can see how they might think that, it’s not what I was trying to communicate. Jack and Mabel are very much alive throughout the book and trying to figure out how best to be alive.